With less than three weeks to go until the Season 2 premiere of Fringe, Fox will begin airing repeats of Fringe - but with a twist! In a broadcast first, FOX is hosting on-screen Twitter updates with Joshua Jackson, John Noble, Jeff Pinkner, and J.H. Wyman during a special “tweet-peat” of FRINGE on Thursday, Sept. 3 (9:00-10:00 PM ET/PT). During the episode, viewers will have the opportunity to follow the cast and producers’ tweets – both online via Twitter and on-air via a lower-third scroll. They will provide commentary about the episode, answer fan questions, reveal behind-the-scenes secrets and offer exclusive insights on the upcoming season. 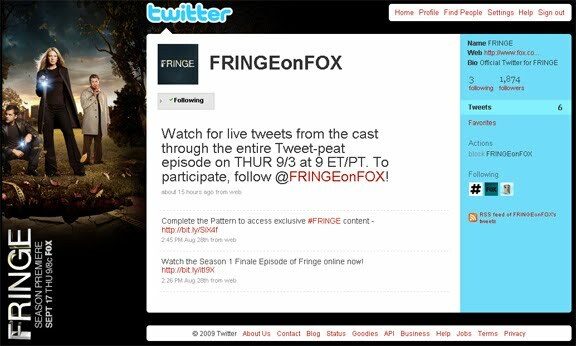 Fans should sign up now at http://www.twitter.com to follow the cast/producers, then on Thursday, Sept. 3 at 9:00 PM ET/PT, viewers can follow the FRINGE event at http://twitter.com/FRINGEonFOX. Fans have the chance to interact with the cast and producers by replying to any of their tweets. Also, fans should remember to use #FRINGE in their tweets so they can be easily found. Please note: Jeff Pinkner and J.H. Wyman will be Tweeting during both the Eastern Timezone (ET) and Pacific Timezone feeds, but Josh Jackson and John Noble will only be available during the ET broadcast. IMPORTANT NOTE: Last night's Tweet-peat was a ONE-TIME event! There WILL NOT be Twitter updates on future Fringe episodes. Which episodes will they air? 19 and 20?? yes they are doing the "The Road Not Taken" tomorrow and the Finale next week. I have friggin preseason football...grrrr....Adam and I might be screwed on this. sorry but I don't like to view the tweets. Come on, I want to watch the show. How can I turn this off without just turning off the entire show!? As soon as tweeter started, i stopped watching. How ANNOYING the boxes aer! Just started to watch and it took all of 5 seconds to turn it off and switch channels. Sorry.. if this is the future of television shows I'm glad I've not yet bought an hdtv because we'll be tossing it out the window.... utter crap! If I want to look at twitter I'll logon to the site, I do not want to see this on my TV screen. AGREE! How come every time there is a show that is outstanding, they screw it up the second season! DON'T screw this up and distract us with BS conversation. This is a time to put away the distractions and watch good tv. We turned it OFF! I only hope it stops before the new season starts...or you've lost some VERY loyal watchers! Taking up 1/3 of the screen with tweets is a bad idea. If I want to read I will turn off the TV and read a book. I was looking foward to watching the show but had to turn it off after about 20 seconds. It was horrible. If I wanted to see the Twitter stuff, I would have checked on my PC. Don't ever put Twitter on with any TV shows. The tweets are very disruptive. I turned it off. I will NOT watch any show (even Fringe) with those blasted tweets on the screen. Please don't do this again. I hate this Tweet-Peat. I love Fringe so you know how upset I was when I thought I would be able to get caught up on my favorite show only to find that I can't enjoy it because of the twitter crap all over my screen. Could'nt you at least display that mess in lower corner of the screen in stead of smack dab in the middle. This may be enough to stop me from watching one of my favorite programs. I turned off Fringe when the twitter comments started. If I wanted that crap, I would have logged on to twitter - which I didn't. I have never written a comment before.....that tells you how strongly I feel about this. Keep it off my TV!!!!! So posting this on TV made me turn the damn show off even thought I like the show. Stop it! It did get me to join twitter just so I could write and complain about how much I HATE IT!!!!!!!! !This may be a repeat, but missed a few episodes and was hoping to get caught up but guess that won't be happening now! Half of our tv screen filled with twitter crap. YOu ruined the show! Who could watch the show with the annoying scribblings on the screen, and who cares what they are saying, obviously many of us have the same opinion. Please, stop the on screen tweets. I just turned off my TV. Hate it, Hate it, Hate it! Please, producers of the show, stop tweeting and read these posts. WE DON'T WANT IT! I won't be able to watch the new season with this. The whole tweet-pete idea was horrible. Like others said, it took up a third of my screen and was very annoying and even the ones I did read didn't seem to be that interesting. It was a horrid distraction to a good show. I made it to the end just because I had missed this episode previously and really wanted to see it, but it was very hard to have to sit through the twitter stuff. Please don't do this again!!!! I want to enjoy the show and if I want to see the Twitter side, I will turn on my computer. I was recording the episode, and turned it on to see how it was going, and I'm really mad that twitter is on the screen, It's covering almost half the screen, If its on next episode, I won't watch the show any more. It is completely distracting and ruins the show!! Turn off the Tweets, you twits! I stopped watching the show 1/4 of the way through. Hate it! Hate it! Hate it! That was the most annoying & distracting thing I have ever seen. I love the show I watch every episode. Sorry boys. My wife and I won't be watching Fringe any more. It was too complex for TV before the tweets and now its pretty much useless. On a complex multi-dimensional, multi-plotlined show like this you actually need to pay attention and any distractions serve no purpose. The tweets are a desperate move to save a show that could have been another X Files but because of random chaos and change you never knew what you were going to tune in to. If you missed an episode you would never recover you ability to track with it. Anyhow hope you do better next time. Fringe's twittering idiots was the topic of conversation at lunchtime today...and not in a positive vein. We all felt it was an intrusive, distracting and, frankly, pointless invasion of our private time. When I come home from work, I want to relax with a tv program I really like (and I really like Fringe)...Well, that didn't happen. After about 10 minutes of trying to figure out what the hell was going on, I changed channels and watched something else. I HATE that silly Tweatpeat. It is all over the screen. If you MAYBE shunk the video so the inane comments were below the screen, MAYBE. But I just hate what you've done. At least with pop-up videos, they place the windows in places that don't cover up the screen. PLEASE STOP THE MADNESS--NO TWEATS WHILE WATCHING!